Thursday night was League in a Night. 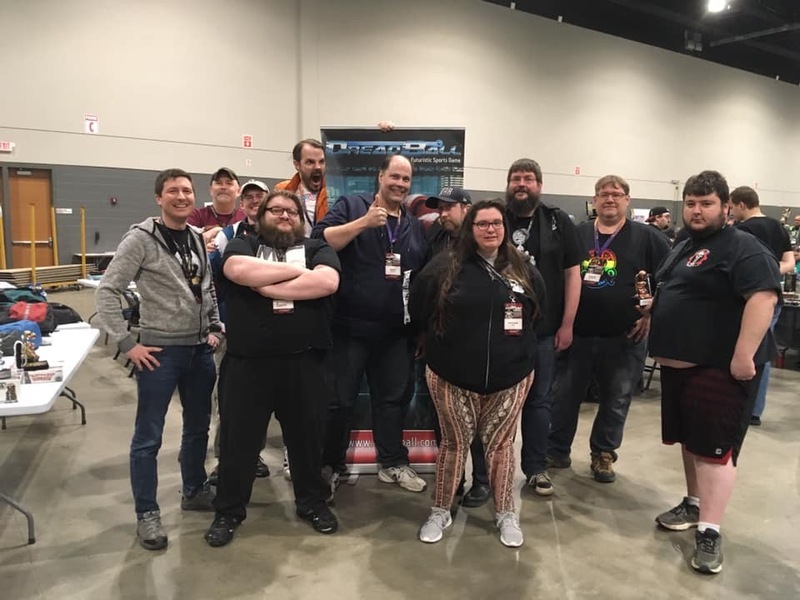 BreadDoll takes credit for creating this event last year and it was back again in 2019. With 12 coaches participating, this year was twice the size of last year. Not only were there twice as many coaches, in my opinion this years was twice the fun. League in a Night is a relaxed, fun event. 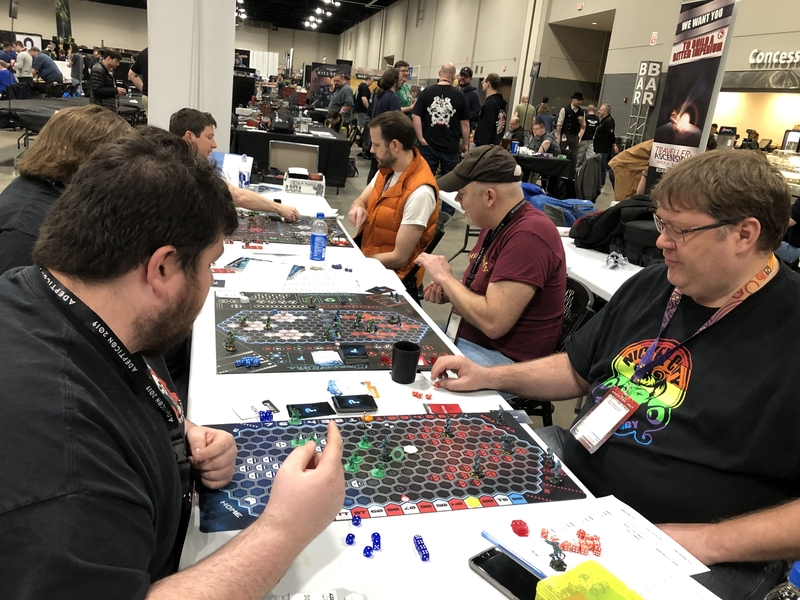 Four rounds of DreadBall are played using the League rules for DreadBall. I’m happy to say yours truly pulled out a win in the end having the best winning record (4-0) if not the highest ranking team in terms of megacredits. 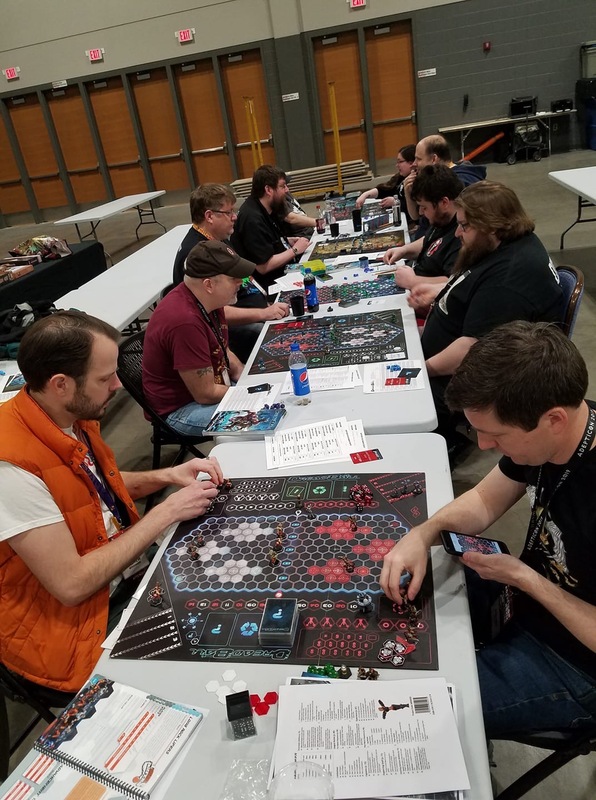 If I could only play one DreadBall event at Adepticon it would be League in a Night! I will quickly mention Deadzone since I played in the tournament on Friday. 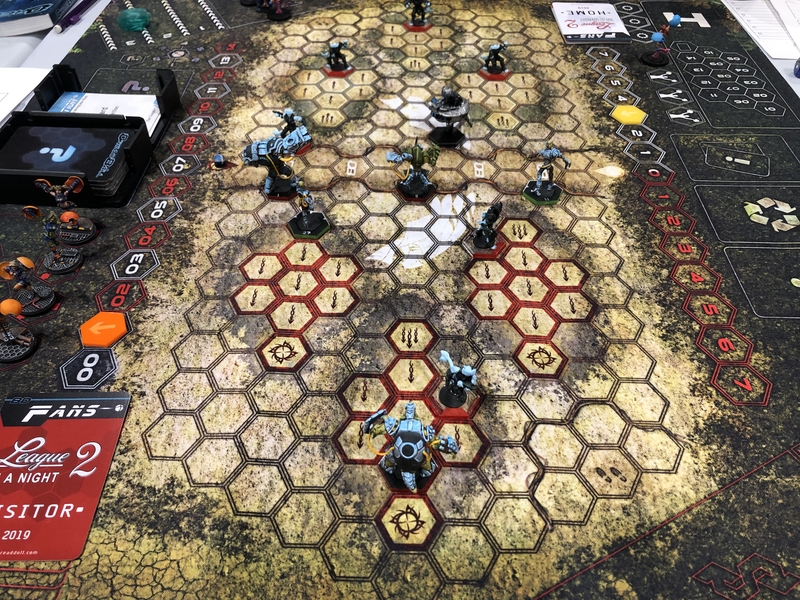 As you may not have heard of Deadzone, it’s another game by Mantic, a skirmish game set in the DreadBall Universe. 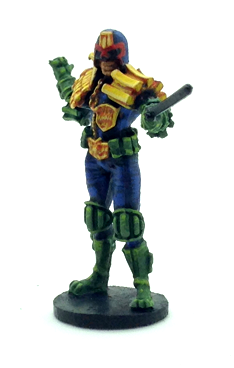 Deadzone tends to take all it’s best ideas from DreadBall ( 😛 ) and the Nameless have now made their way over I painted up a Nameless team. I lost but I won best painted. I had fun. Moving on. 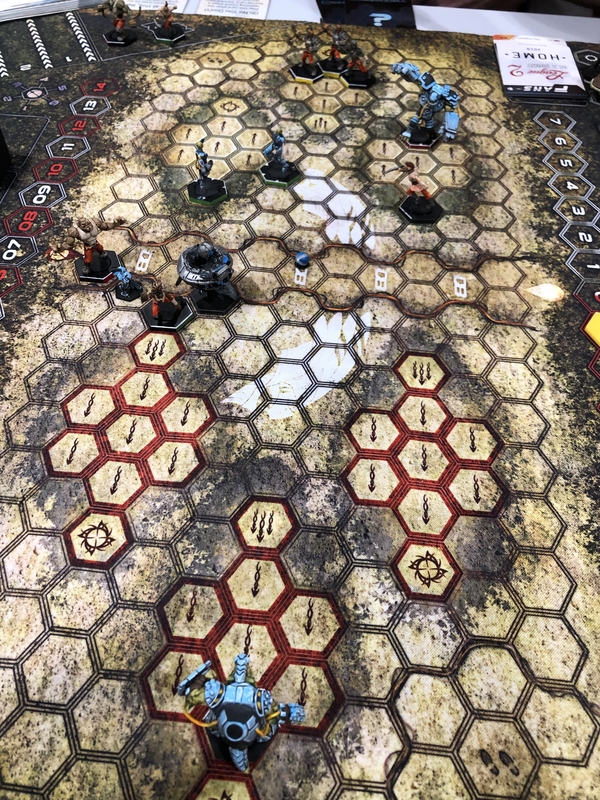 Saturday was the DreadBall Adepticorp Cup. 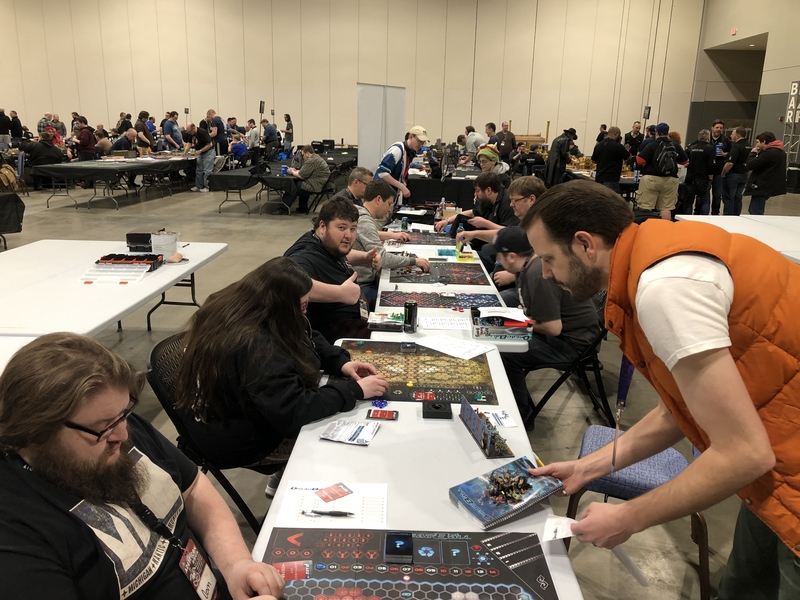 This is the North American DreadBall Championship tournament. There were 10 coaches competing this year. While it’s not the most coaches I’ve seen participating for the North American title, the competition was fierce! Over the course of four rounds I went 3-1-0 and pulled off a tournament win and the Championship by a very, VERY narrow margin. TWO fan check was the difference between winning and losing. Thanks to Bryan Novak for running the tournament and providing the results. 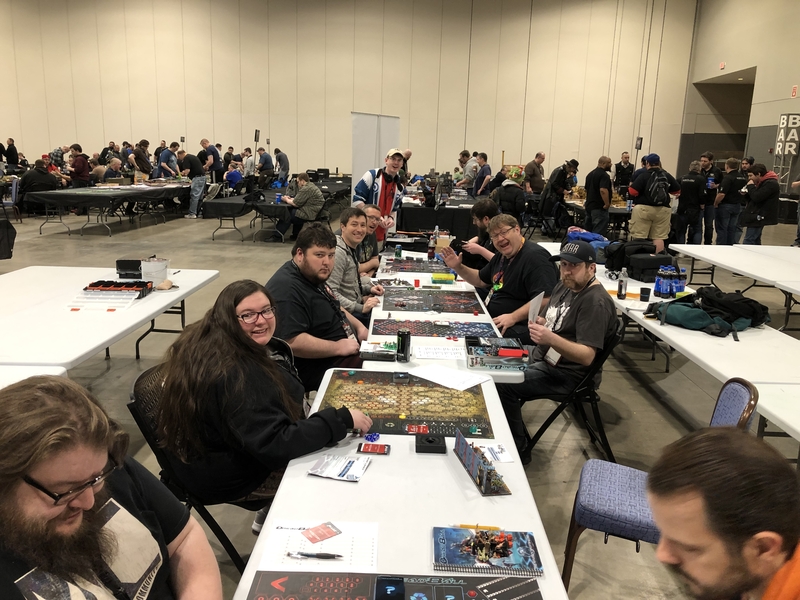 After the Adepticorp Cup we only had a couple hours until Mantic Night. It has become a BreadDoll tradition now to run a game of DreadBall Ultimate during Mantic Night which we did again this year. I will leave it to my BreadDoll colleague to provide the details since he was running it but Ultimate was played and everyone playing had a blast! Here are a few pics. 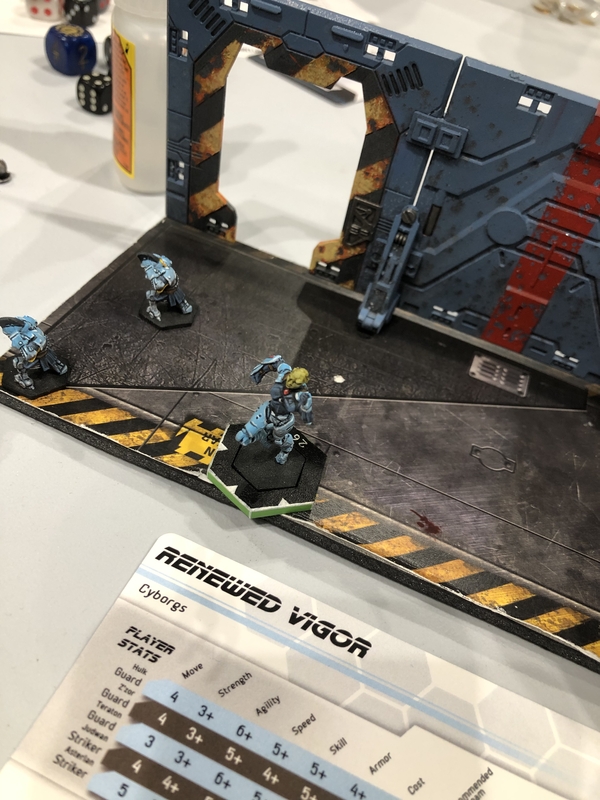 Adepticon was amazing! I am already looking forward to the next one in 2020. If you can come I highly recommend it. 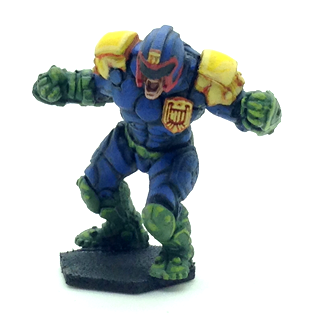 And if you do and you want a game of DreadBall just let me know, we’ll make it happen. 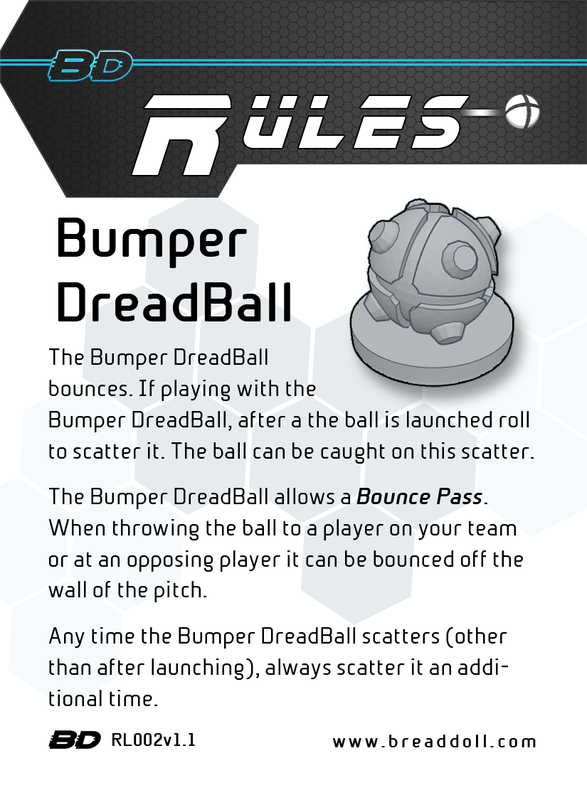 There’s no such thing as too many friends or too much DreadBall! 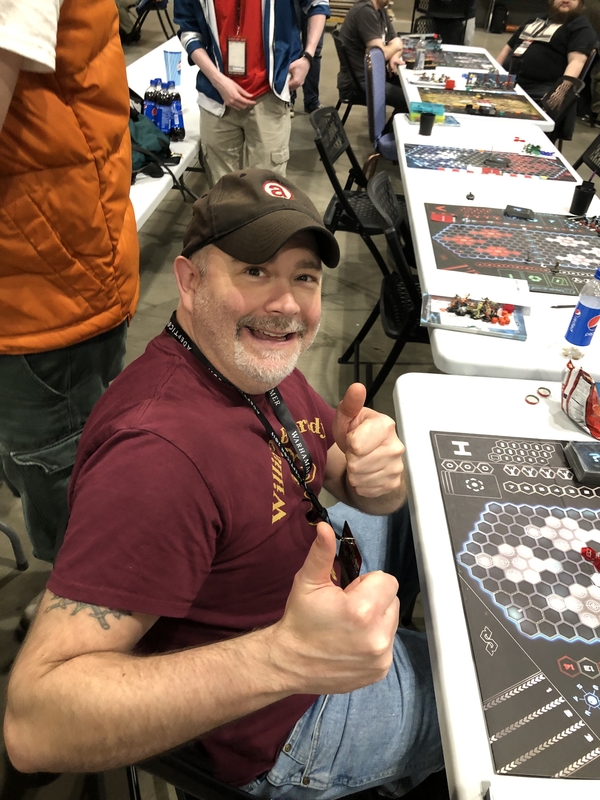 Adepticon 2019 in Schaumburg Illinois (outside Chicago) is just over 2 weeks away. 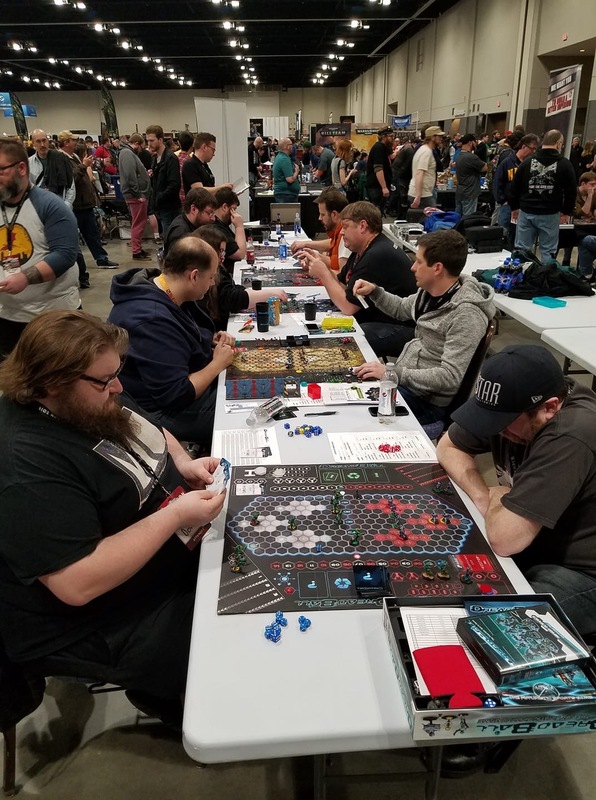 There are several DreadBall Events going on you won’t want to miss if you are going to be there. 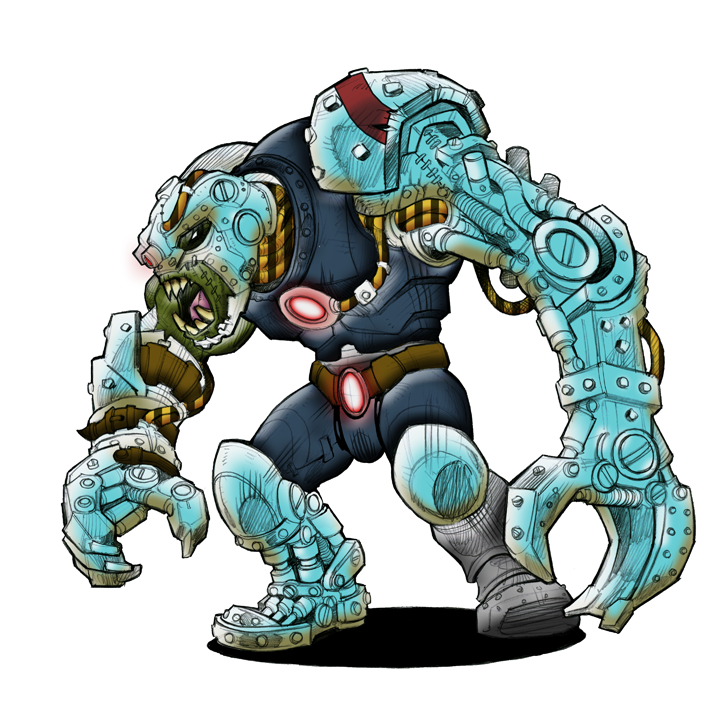 DreadBall Ultimate: Clash of the Giants – this epic game of DreadBall Ultimate brings the “big” talent to the pitch. 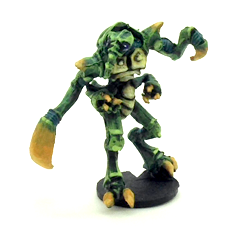 This game will be happening at Mantic Open Night, Saturday night starting at 8pm. Get your ticket here. You can find the RULES & REGS for the tournament and League night on the documents page. Don’t worry if you want to play but haven’t pre-registered. 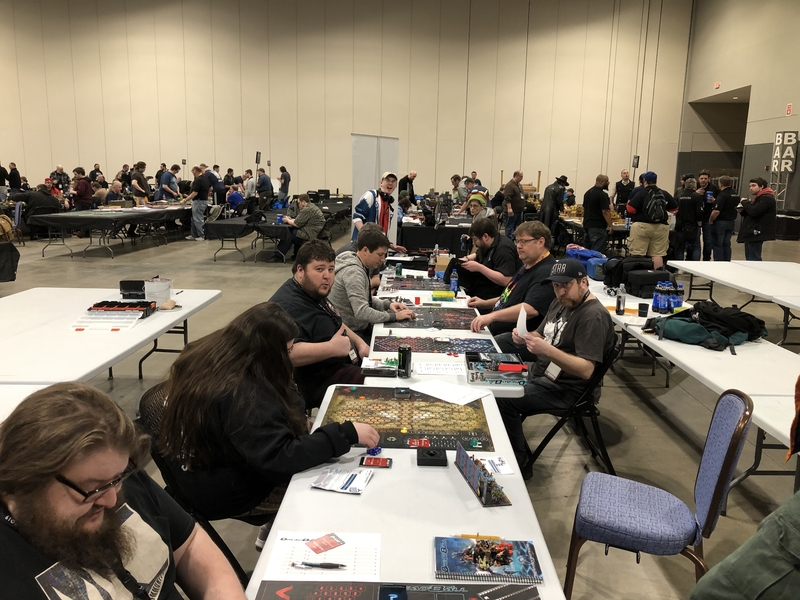 You can register at Adepticon when you get there or just show up with your entry fee at the correct place and time and there will be a seat for you. 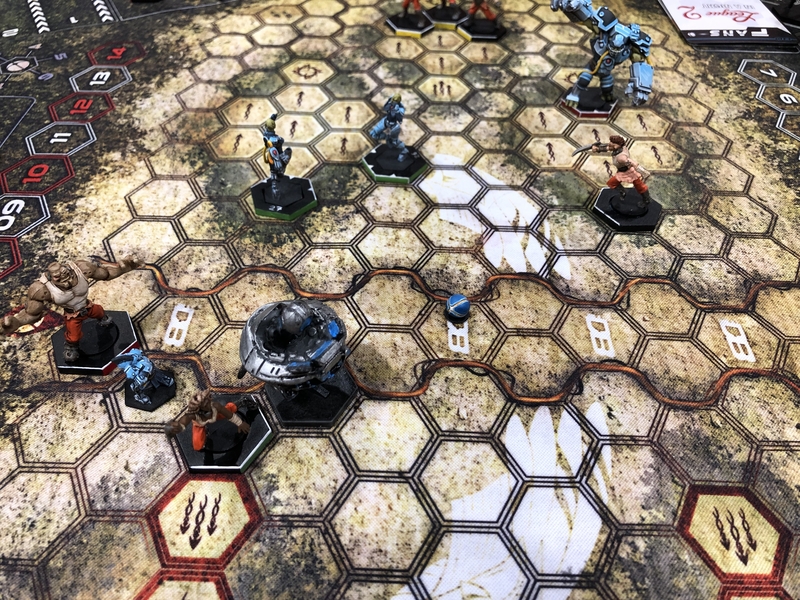 Here comes the Ontario DreadBall League! 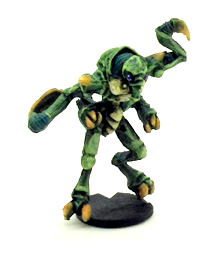 I’ve wanted to get a DreadBall League going again for a few years now. A while back some friends and I had a small League but it wasn’t well organised and eventually fell apart. The time has come to give it another try. We are stating small with 4 coaches. We’d hoped to get 6, which seems like a good number, but we decided better to just start than spend any more time recruiting. That said, if you are in Ontario and want to join let me know (geoff@breaddoll.com) ASAP, and we’ll see if we can work it out. 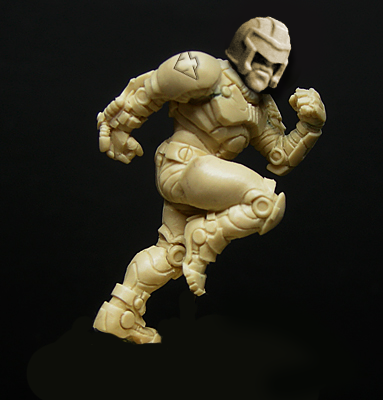 If you’re on the fence stay tuned for updates on Season 1 of the Ontario DreadBall League (ODBL or OddBall). We’ll likely do a Season 2 starting in the summer and look to expand the number of coaches participating. The plan is to have each coach play each other coach twice. One game will be as the Home coach and the other as the Away/Visiting coach. We’ll have 2 weeks to organise and play each match. With 6 matches on the schedule the league should take about 3 months. This will work with only 4 coaches. Once we expand the league we will have to revisit how we run the schedule. Maybe divisions? I have decided to play Brokkr in Season 1 of the ODBL. 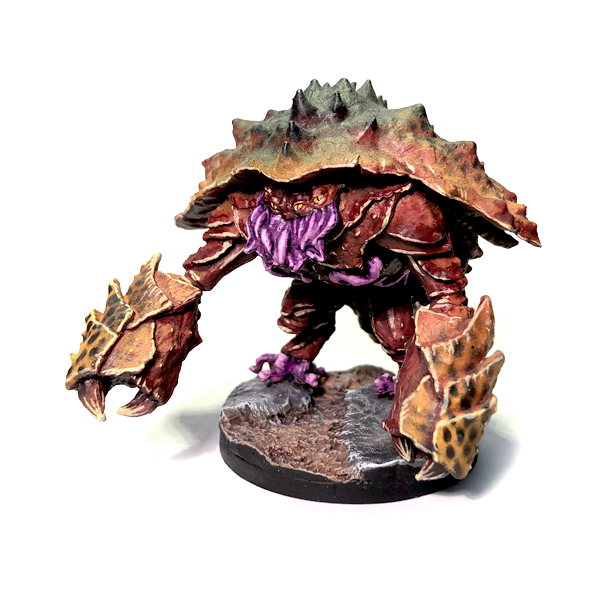 I was planning to play them at Adepticon this year so choosing them for this league will incentivize me to get them painted and ready to go. I will also magnetise the Brokkr Guard(s) arms and heads so they can be converted to Keepers over the course of the league. I will have more information on the ODBL in my next article. 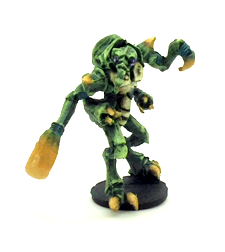 Hopefully we’ll have at least played our first match and I’ll have pics of my painted Brokkr team. Wish me luck and I’ll talk to you in 3 weeks. 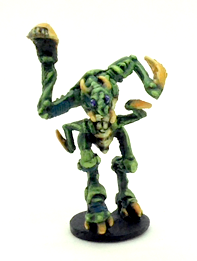 I painted my Z’zor a few years ago now. I was living in Vancouver Canada for a month for work and it happened that a pretty nice game store there happened to be starting a league at that time. 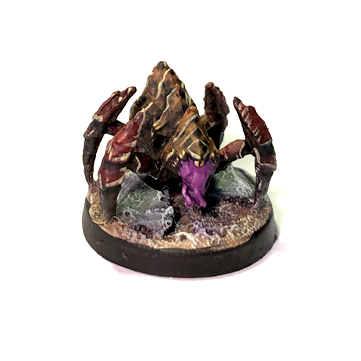 Here is how I painted the Hiveworld 8 Warriors. I went with a green and orange color scheme. I tested it out in Photoshop before starting. As always I use primarily Army Painter paints. 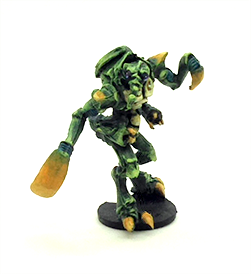 I used a grey spray can primer to prime the minis and then applied a Goblin Green base coat. 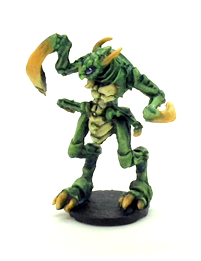 I used Green Tone as a wash and then used a series of drybrushings from Goblin Green up to Vallejo Line Green. Finally on the green parts I did a highlight with Lime Green and White. The orange bits I started with a Secret Weapon Sewer Water wash over the green base and then Vallejo Light Orange. I thinned the Light Orange down with water and applied multiple coats the achieve a bit of a blend. I highlighted further with Vallejo Pale Yellow. 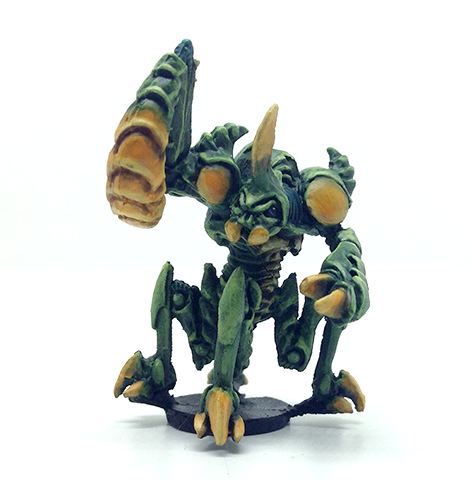 For the torso/stomach plates I also used Pale Yellow but here as the base color. I washed it with Vallejo Sepia wash but you could also use Soft Tone, they’re very similar. After the wash I did a touch-up highlight with the Pale Yellow again and then with a mix of the Pale Yellow and White. 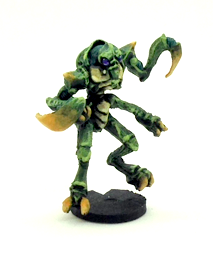 On the joints I used Hydra Turquoise with a Dark Tone wash, highlighting back up a bit after the wash using Hydra Turquoise again. I used Black on the eyes with a purple highlight. Back in November of 2016 my fellow BreadDoll editor Andrew hosted a DreadBall tournament call “Judgement Day”. 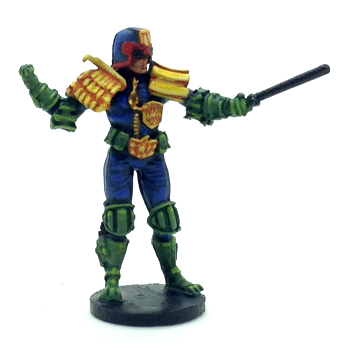 The idea was that the referee for every game in the tournament would be Judge Dredd. 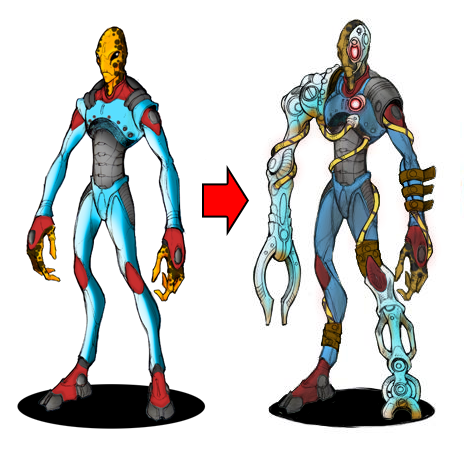 For those that aren’t familiar. 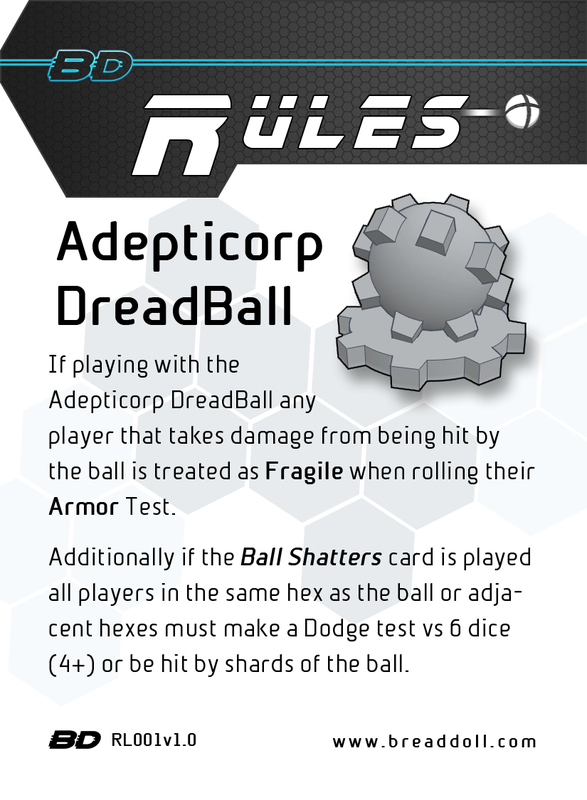 Back in 1st Edition DreadBall there were alternate referee rules for using Judge Dread instead of the RefBot. 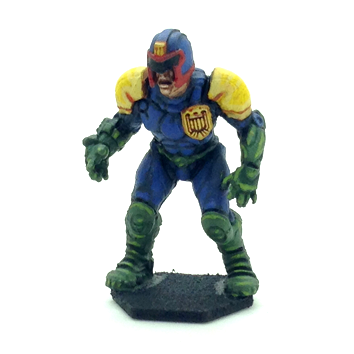 Mantic produced a Ref Dredd mini. It was great fun. 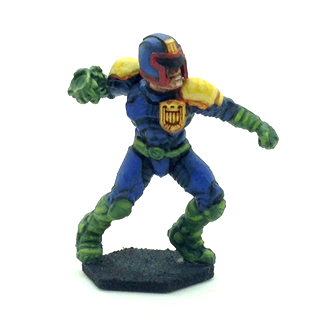 Although Andrew was providing Ref Dredd models to use on the day I still decided to paint my own (above). 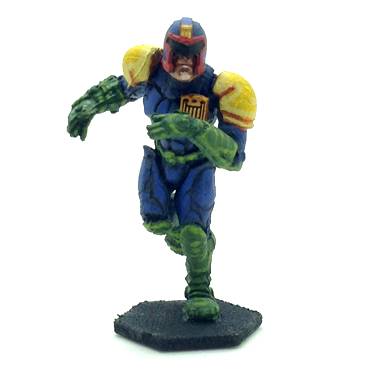 I also decide to take it as far as I could and create a whole team of Judge Dredd themed judges to use as my team in the tournament. A conversion was needed. 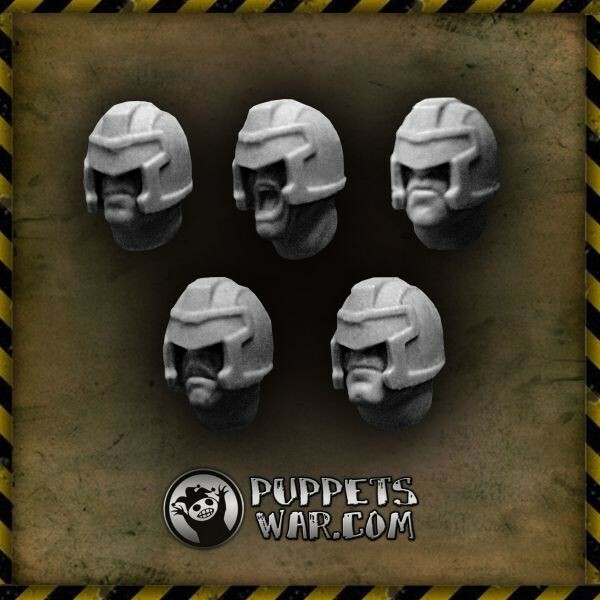 I found some heads that were the key to my conversion at Puppetswar. 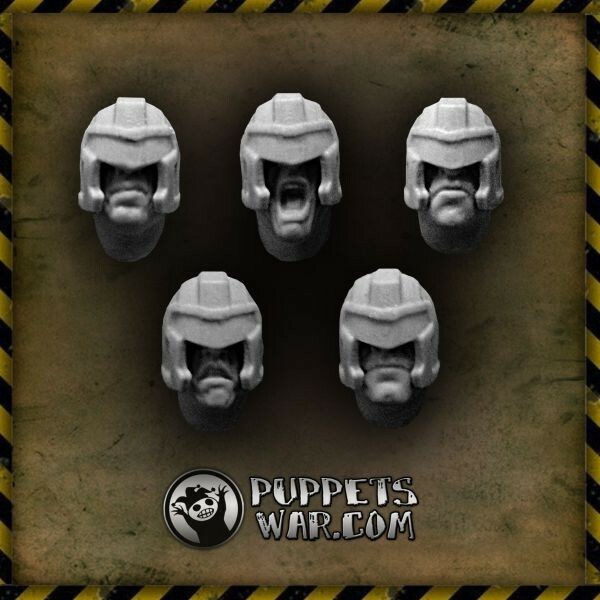 They are sold as “Executioner Heads”. I decided to use the Trontek 29ers as the basis of my conversion. Before buying the heads, which looked perfect, I did a few mock-ups in Photoshop. I was happy with the mock-ups. I ordered the heads. Looking more at the mock-ups while I waited for the parts to arrive, it occurred to me that the conversion would need one more thing. Badges. 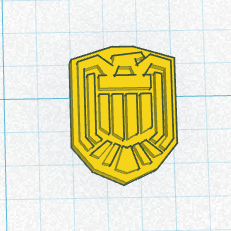 I set about designing a tiny little badge in 3D and doing another mock-up. Again the mock-up pleased me and the 3D badge design looked good. It was time to send the 3D file off and get it printed. 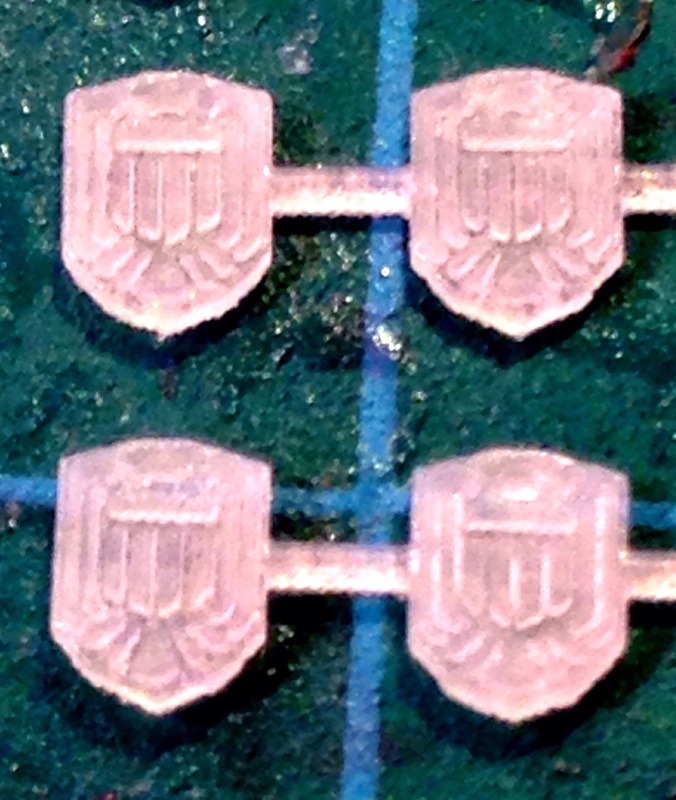 I sent my design for printing using Shapeways and the result was perfect. I cut off the Trontek 29ers heads using modelling clippers. 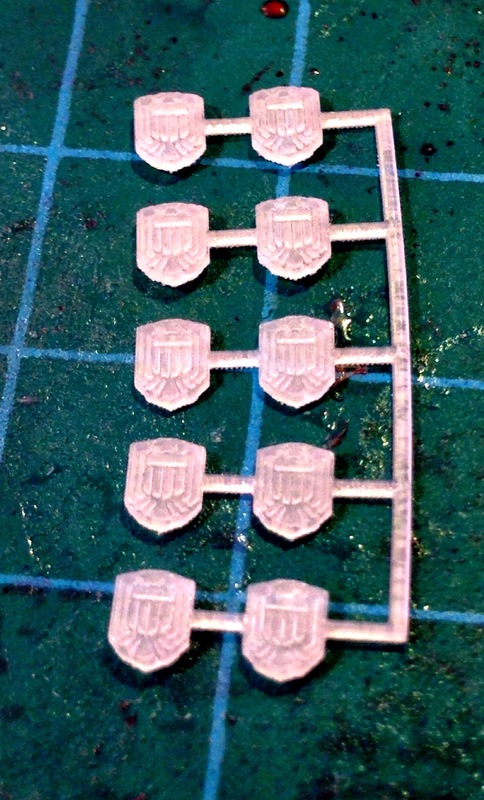 Some crazy glue and patience later I had attached the new heads and badges. It was time to paint them. A quick color test to start. 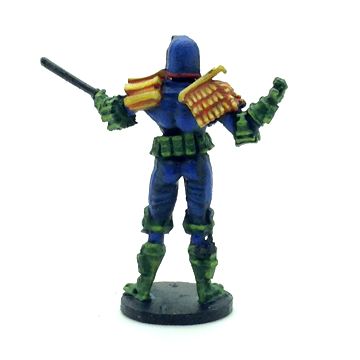 To paint the blue body of the judges I used Army Painter Ultramarine Blue. I washed the base color with Army Painter Dark Tone before applying another layer of Ultramarine Blue as a highlight. 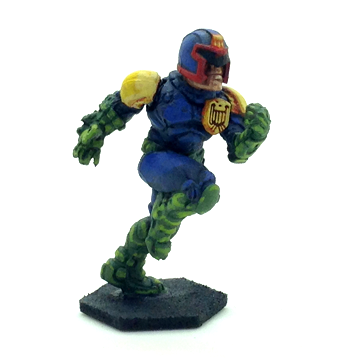 The green boots & gloves were base coated in Army Painter Army Green and washed with Army Painter Green Tone. 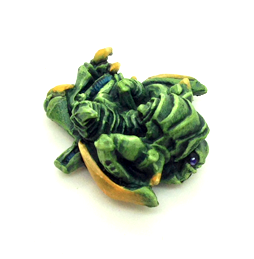 A highlight of Army Painter Goblin Green finished it off. 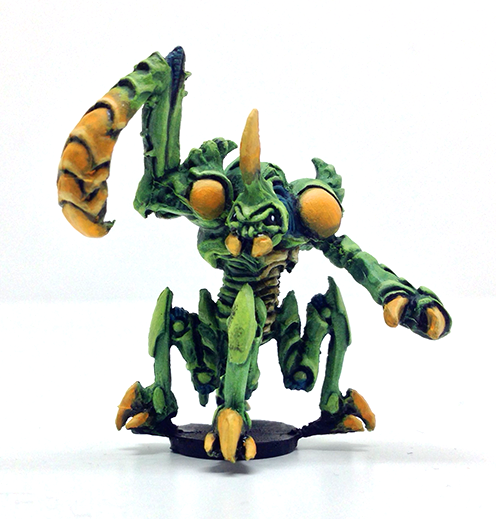 The yellow bits were base coated using Army Painter Lava Orange. Reaper MSP Candlelight Yellow was applied over the orange base. Some red, black and flesh details completed the look. Clearly it was far from my most complicated paint job but the results were satisfactory. The team was done and the conversion looked great. 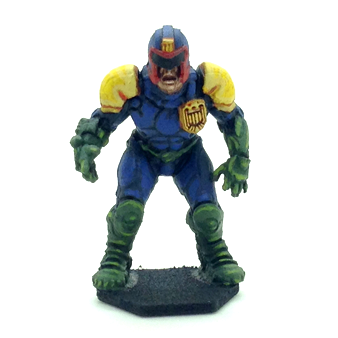 The Law was ready for Judgement Day! What are Fan Support cards? In DreadBall 1st Edition, the game came with 52 game cards in the deck as well as 2 Fan Support cards as seen below. 1st Edition Home Fan Support card. 1st Edition Visitor Fan Support card. DreadBall Ultimate in 1st Edition also came with Fan Support cards. How are Fan Support cards used? Fan Support cards are used to help manage your fan checks. Your Fan Support card is placed on or beside the pitch. When you draw a fan check it is placed, face up, underneath the Fan Support card such that the pips are still visible. As soon as you acquire 3 (or more) Fan Check pips you take all the Fan Check cards that contributed and turn them over face down underneath the Fan Support card. Fan Support card placed beside the pitch. Fan check cards face up underneath the Fan Support card with the pips visible. Fan check cards flipped face down once 3 (or more) pips are collected. New fan checks face up under previously flipped fan checks. The Fan Support cards are also used to determine which coach takes the first rush when it is determined randomly. Shuffle the Fan Support cards and place them face down on the pitch. One coach chooses a card determining if they are Home or Visitor. In 2nd Edition DreadBall the card deck comes with 54 game cards and no Fan Support cards. The Fan Support cards were dropped in favour of a couple more game cards. More game cards is a good thing but it was sad to see the Fan Support cards not included in the game. While Fan Support cards are not strictly needed to play they add to the overall easy and organisation of DreadBall. Since the launch of 2nd Edition BreadDoll has created and given out Fan Support cards to all the coaches at all BreadDoll sponsored events in 2018. I highly recommend playing with the Fan Support cards. 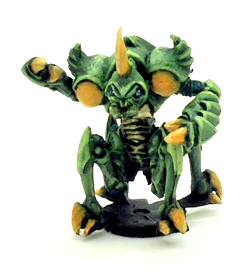 I even made new ones for 2nd Edition DreadBall Ultimate. Adepticon is fast approaching. It’s not actually until the end of March but it sure feels like not much time. 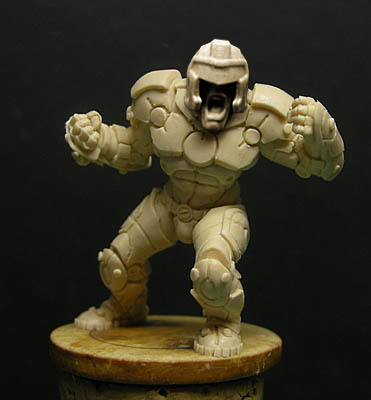 I have a lot of DreadBall projects I need or just want to get done for Adepticon. 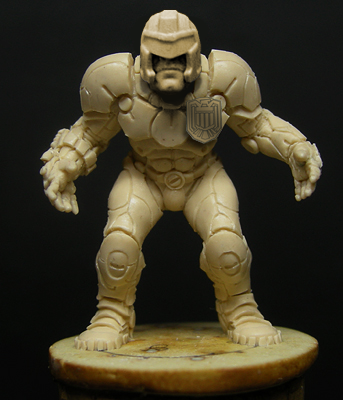 I’m planning to play the Cyborgs in the Adepticorp Cup tournament at Adepticon. I need to figure out my roster and then paint the team. Since I don’t already have them painted I’ll need to paint the default roster plus any extra players I want for my tournament roster. 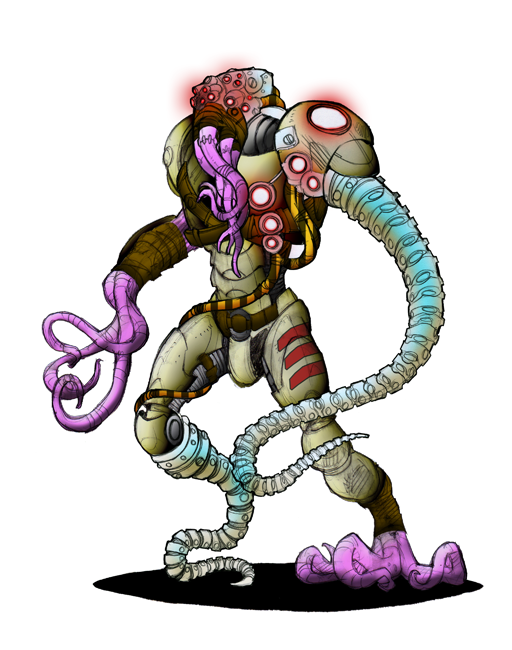 Here are some color test I did for how I think I’d like to paint my Cyborg team. I’ve already done a bit of a write up about my 3D pitch. I haven’t made enough progress to give much more information yet. 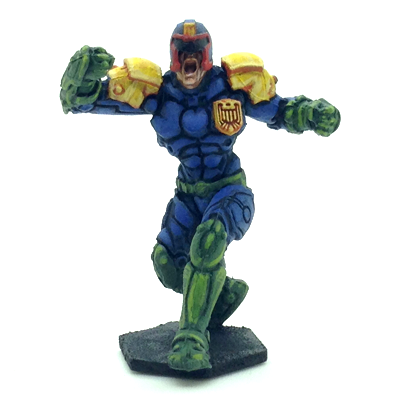 I’ve wanted to make a DreadBall miniature diorama for some time. I figure Adepticon is good motivation to do so. I have the parts assembled for a scene of Kalyshi vs Yndij. Now I need to get to work (so much work). 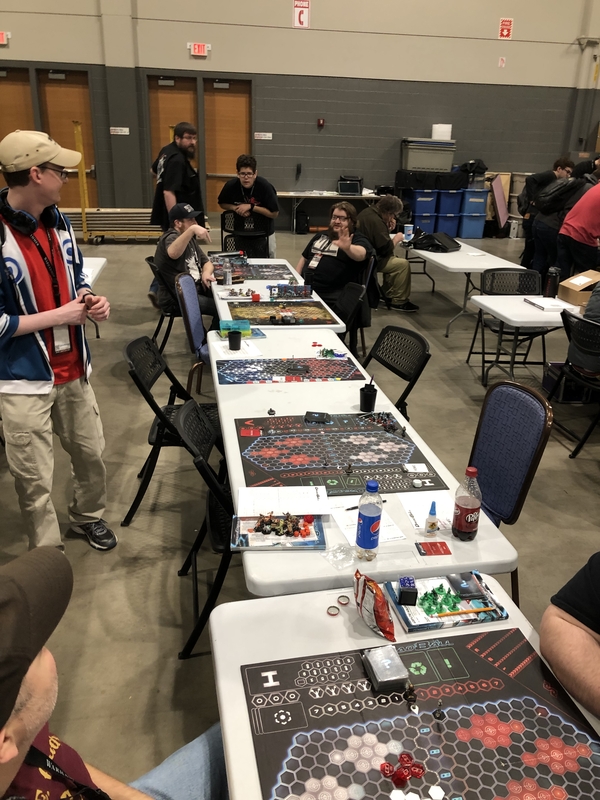 This past March at Adepticon we did a League in a Night event. It was great fun so we’re doing it again. 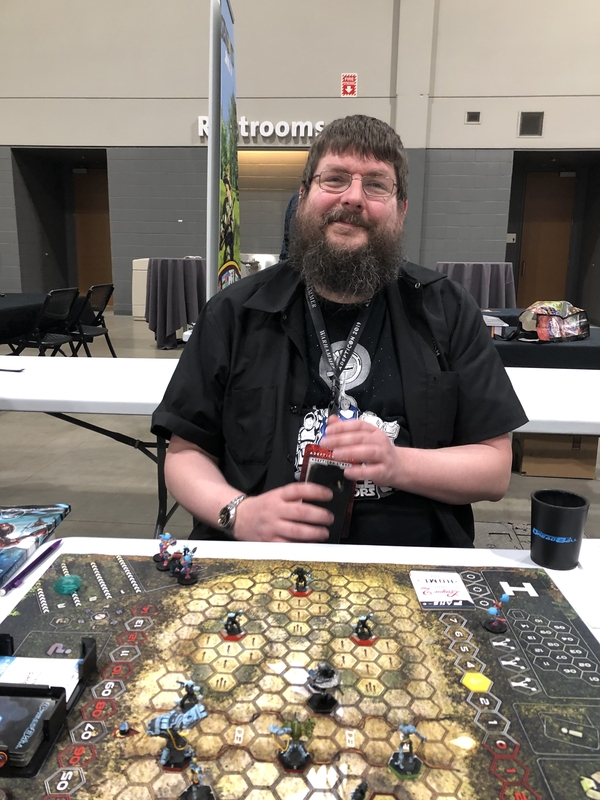 The idea is you play 4-5 games of DreadBall like in a tournament but you advance your team like you would in a League. I’m looking forward to League in a Night 2 (LiaN2) as much or more than the Adepticorp Cup tournament. I haven’t decided on a team yet. I need to figure out my team and get them painted up (if need be). I also need to prepare all the schedule and documents to actually run the event. I have one more project I’m working on (as if I didn’t have WAY too much to get done already in the next 5 months). The Sole Survivors.